Every Friday, after lunchtime prayers at the East London Mosque, an odd-ball collection of angry looking men from Hizb ut-Tahrir and the banned Al Muhajiroun group try to hand out leaflets to departing worshippers. They rarely persuade anyone to read them and most of those who do simply roll their eyes. For several years now, Tower Hamlets has been a magnet for nutters. Some of them even tried taking George Galloway “hostage” during his 2005 general election campaign. Last week, another leaflet was dished out. 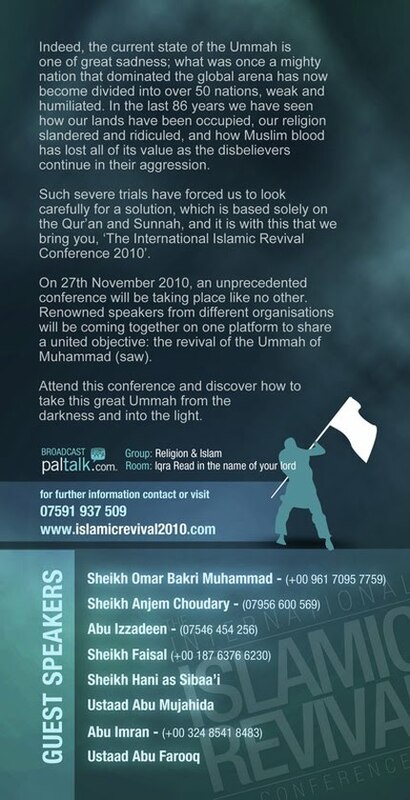 This was one was for an event/group called IslamicRevival 2010 which was planning a day of speeches on November 27. Among those who were due to talk were: Omar Bakri Muhammad, who has just been captured in Lebanon after a conviction there for inciting murder and possessing explosives; Anjem Choudary, the motormouth hate-preacher formerly known as “Andy”; and Jamaican-born ex-con convert Trevor Brooks, aka Abu Izzadeen. Spot the venue? Collingwood Hall in Bethnal Green. The hall is owned and managed by the council and I understand the booking was accepted by a town hall based official last month. When council chief executive Kevan Collins found out on Friday, he ordered an investigation. The booking has since been cancelled. At the park I watched everyone gather into a peaceful group , packing the park, and all united against the EDL. 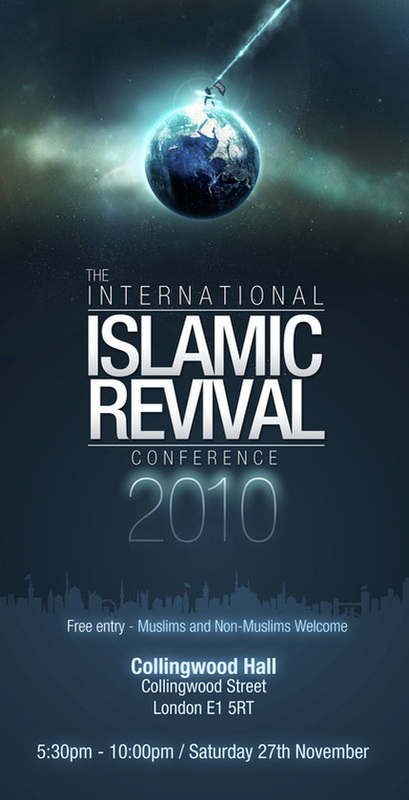 Then I heard ‘Lutfur Rahman’ speak, he went into a long diatribe about the Troxy, and what was going to be a peaceful islamic conference, informing us that this was cancelled by our Council. That the council had no right to do this, and we must boot out these people and vote for strong leadership for our borough. Thats when it finally hit me, thats when I finally realised two things. One that ‘Lutfur Rahman’ supported the Islamic Conference and apparently by castagating the council in this way, that this was an admission that he could see no harm in allowing this type of ‘hate speech’ (if the allegations are true) into the borough, and Two, that what I was witnessing was not solely about the EDL, it was about voting for our new soon to be elected Mayor. Will Mayor Rahman now be booing the decision to cancel the Collingwood Hall event? Did he even know it had been cancelled?